Editor’s Note: During this Year of Faith, we present a series of reflections from Redemptorists who began their religious and/or priestly lives in the years during or immediately after the Second Vatican Council. By Rev. Thomas Deely, C.Ss.R. I was ordained in June 1965. The Second Vatican Council, begun in 1962, closed as I was ordained. One of the purposes of that Council was to “open the windows of the Catholic Church and allow the fresh air of renewal to enter into it.” A lot of fresh air did enter. We were no longer “locked into the seminary.” We could now get out and meet the people and be involved in apostolic work. Before the Vatican Council there seemed to be a belief within the Church that if you locked up a seminarian, got him to pray and be silent, and not care much about what was happening in the world, that the supposed happy result would be a holy seminarian who would go out into the world full of prayer, the Word of God and holy devotions and who would win the world for Christ. I never really believed that. Neither, I think, did those who called for the Council to bring the Church to a new and fresh encounter with the modern world. As the spirit of the Council gradually changed the attitudes and the rules of our seminary formation, we gradually began to see what youth like ourselves were doing in the world. It was the Sixties! They were fighting for civil and human rights. They were protesting a most unwise war in Vietnam. They were struggling to undo poverty and injustice both in the U.S. and throughout the world. I began to resent the isolation that my seminary formation had demanded of me. I knew it was not right. As a 24-year-old young man, I gave my first catechism lesson and felt so disconnected from those seventh-graders, so “out of it.” I cried, I wept for shame and in anger. I was glad when I was finally a Redemptorist priest who could go out and preach the Gospel of Jesus to real people in the real world. The freedom was great. The new openness in our Church was wonderful. What weren’t so great were the selfish and worldly values that assaulted our Church. The windows were open. The fresh air was coming in. But in also came the poisoned winds of doubt, of a desire for pleasure and comfort. In came the tempting message that the Cross, that suffering and sacrifice, were a waste of time. So out of those same windows, through which that fresh air had poured, jumped many who decided that following Christ as a religious, a priest, a missionary might not bring them all that they personally desired. In the 48 years I’ve lived as a priest since the Council, I have now realized why our superiors were so worried about protecting us from the world. They were, in many ways, correct. Fidelity as a Redemptorist priest has not been any easier than it is for any good individual Catholic or married couple. Fidelity takes prayer, humility, and a generous acceptance of the Cross and of the crosses in our lives. Let me end quoting a young Passionist nun who gave the best and shortest vocation talk I’ve ever heard. She said, “If I had it to do over again I’d still choose to be a nun!” The same goes for me as a Redemptorist priest. Fr. Deely professed vows as a Redemptorist in 1960 and was ordained in 1965. 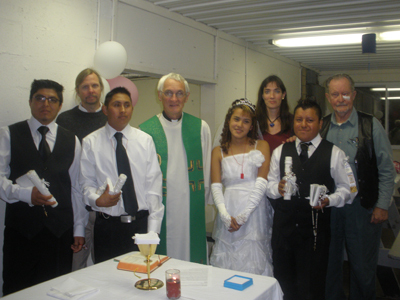 He is currently ministering to migrant workers and immigrant families in and around Esopus, NY.